It's an old story that's been told over and over again. Simply put: the Good Guys vs. the Bad Guys. By taking a few cues from stage production, the professional wrestling industry has cashed in on that theme for decades. As of late, the iconic characters who have risen from pro-wrestling as good guys and bad guys look more like they walked out of a comic book than from the "sacred squared circle," which is one reason that some may be puzzled by how so many adults still attend wrestling events. 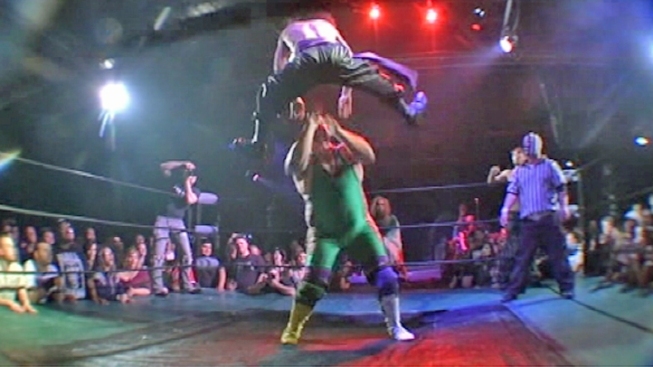 The cast at Oakland's Hoodslam Wrestling show are anxious to break those kind of wrestling stereotypes. "The difference with Hoodslam is we're not trying to insult the intelligence of our audience," said Hoodslam cast member Shane Hansen. "We give them a wink and and a smile and we let them know we're in on the joke." The show is a non-stop frenzied pit of action and satire and can be found just about anywhere twenty feet from the stage. From the odd-looking wrestlers, one was described as "coming from the basement of The Power Exchange," to a very adult comic who played a game of "guess what's in my shorts" with a crew member - to a heavy metal band whose name changes from night to night but the moniker used the night I saw them won't be amplified here. The show runs on the first of every month at The Oakland Metro and it travels around the state so you can get a whiff of it or a puff of it easily.